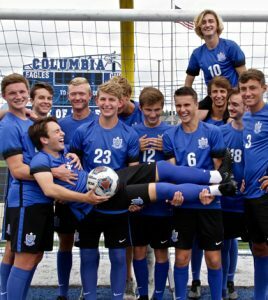 Pictured are senior members of the Columbia High School soccer squad. In another shining moment for Monroe County soccer, the Columbia Eagles and Gibault Hawks each won their Class 2A sectional semifinal matchups Tuesday night at Triad, setting up a rivalry showdown Saturday for the sectional crown. Columbia (21-3-3) posted a 2-0 victory over Marion in the first semifinal. Senior midfielder Alex Barton gave the Eagles an early edge, scoring about five minutes in. Fellow senior Brad Meyer scored on a header in the second half for some insurance. Columbia goalkeeper Alec Venhaus was solid in net once again, finishing with four saves. Helping to preserve the shutout were defenders Charlie Harres, Collin O’Bryan, Aidan Knox and Noah Riley. In the nightcap, Gibault (15-4-5) downed Carbondale, 2-1. Logan Doerr continued his strong senior season for the Hawks, scoring on a first half penalty kick and adding the game winner in the second half. Fellow senior Karson Huels assisted on Doerr’s goal in the 62nd minute. Carbondale came close to tying the game with about six minutes remaining, but the Hawks defense held strong. The sectional final will be played 3 p.m. Saturday at Belleville West. The game was originally scheduled to be played at Triad, but poor field conditions prompted a change in venue. The Eagles and Hawks have met twice this season, with the two teams playing to a 1-1 tie on Aug. 21 at Columbia High School and Gibault winning 2-1 on Sept. 11 at Oerter Park. The second game was played just a day after Columbia lost top scorer Riley Hubler for the season with an ACL injury. Leading the way in Hubler’s absence for the Eagles are Karson Bridges (19 goals, nine assists) and Barton (17 goals, nine assists). 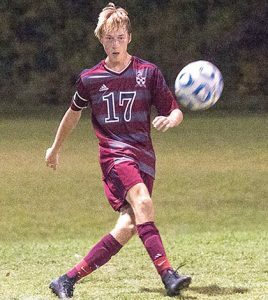 Gibault’s leading scorers are Doerr (20 goals, 14 assists) and Huels (15 goals, 15 assists). 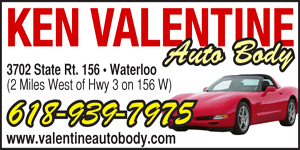 The winner of Saturday’s contest advances to the Chatham-Glenwood Supersectional on Tuesday night. For photos from the regional title wins for Columbia and Gibault, click here.